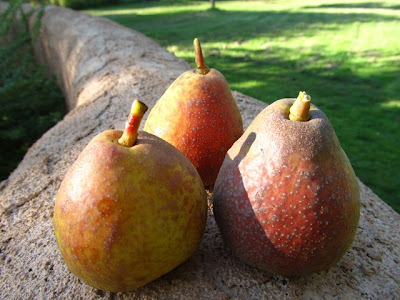 This is when I know fall is near - the pears are ripe from my pear tree. They look delicious, but we've never been able to eat them. They have a really gritty aftertaste that I think comes from the skin. 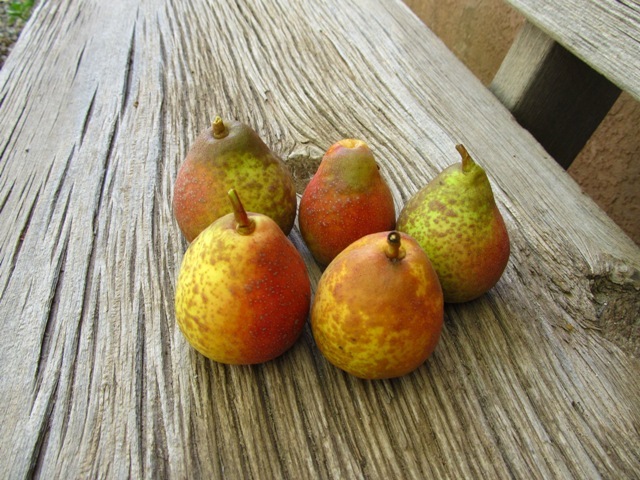 But they look so nice against my adobe courtyard wall! This is my old ranchhouse bench I found at the estate sale place and it seemed the perfect spot to display my pears. 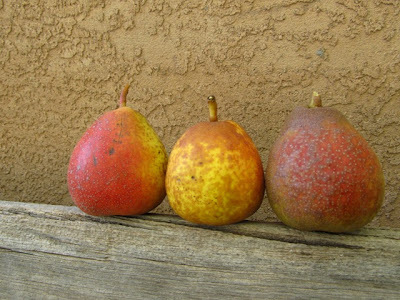 I think there will definitely be a pear painting at Artfest this year. I'm heavy into Artfest painting now - on Monday, I order all of the rest of my frames, plus any canvases I need that have to be special ordered. I also have to pick up my regular canvases. My Artfest countdown includes sizes ranging from 6x6 to 30x40. Also, Saturday and Sunday, October 8 and 9, I will be opening my studio up for the first Annual Alameda Studio Tour. We have 5000 brochures and will be passing them out all over town and also at the Balloon Fiesta. The studio tour runs from 10am - 5pm both days and we are also having a big Preview night on Friday, October 7, from 4pm - 7pm. There will be food, music, a raffle for artwork, displays of our work, etc. It should be fun! If you've ever wanted to take a sneak peek at an artist's studio, now is the time. I will have my studio open and will offer refreshments and maybe a prize or two. Fundraiser - we will also be holding a fundraiser night at the Flying Star restaurant on Wednesday, September 21, I believe from 5pm - 9pm. 10% of all proceeds from the day will benefit the Alameda Studio Tour. Flying Star would like us to bring in an extra 50-150 people to eat at the restaurant that evening. We will have the outdoor courtyard to display work and we hope you'll all come out to join us - because we need the donation! I also have a paintout at the Casa Rodena Winery and Ghost Ranch this month, and the exhibition opens at Millicent Rogers Museum in Taos, on September 17. We have a paint out on the grounds of the museum On September 18. I have two pieces in the exhibition; "LITTLE ADOBE" and "AUTUMN IN SECO."